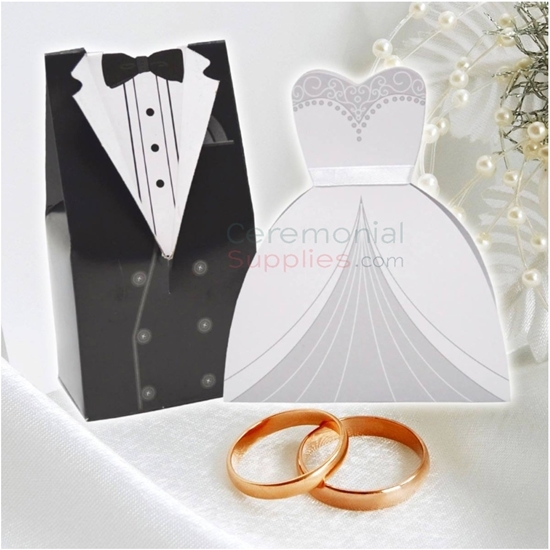 Bride/Groom wedding favor boxes includes 10 pieces per package, 12 packages per order. Bride wedding favor box is decorated in a white wedding dress fashion. Groom Wedding Favor Box is decorated in a black and white wedding tux fashion. Box measures 4 inches in length, 2 inches in width, and 1.5 inches in height. These Bride/Groom Wedding Favor Boxes are the perfect way to distribute favors to your guests. Fill these boxes with wedding favors such as our bubble favors, mini bells, and other wedding keepsakes. The Bridal Wedding Favor Box is decoratively shaped as a wedding dress, a cute representation of the beautiful bride. The Groom Wedding Favor Box is also decoratively shaped, but as a stylish wedding tux, a creative representation of the handsome groom.